I'm not a big NASCAR fan. OK, so I'm not even a novice fan. OK OK, I don't get it. 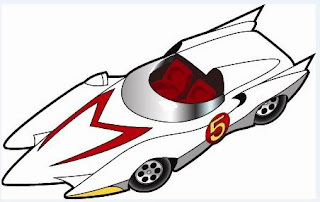 I did always like Speed Racer, though. But today I was thinking again about racing, as a metaphor for life. And for some reason (maybe because I was so close to the Daytona 500 last week), I started thinking about car racing. My main beef with NASCAR being a "sport" has always been, "what's so great about driving around and around really, really fast?" Today, it dawned on me - they aren't just driving around in circles, but they are running the race with a purpose. That purpose is to win. What does winning look like in a car race? Finishing first, being the fastest, not crashing & burning... mainly, finishing first.